Everyone deserves a better car. This might be an idealistic way to view things, but not in our book. So then we asked ourselves, why just stop at a better pre-owned car? Why not a better experience buying one? That's why we came up with WorldAuto. 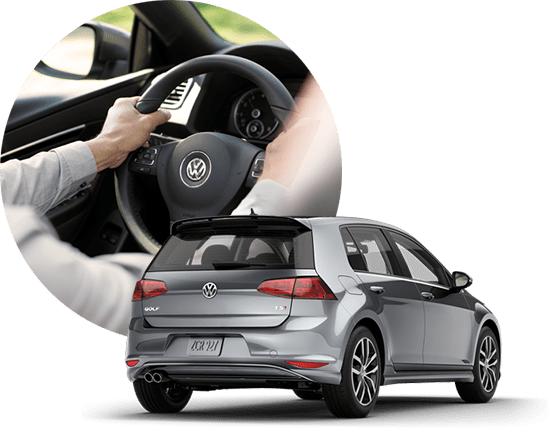 Where you can find great Certified Pre-Owned Volkswagen models, all in an environment where you're treated with respect and dignity. Because after all, you deserve it. A bigger piece of mind. We know buying a pre-owned vehicle isn't easy. That's why we go out of our way to help make you feel safe and secure with your decision. Every Certified Pre-Owned Volkswagen comes with a 2-year, 24,000-mile bumper-to-bumper Limited Warranty. * And if anything does go wrong (because you know, sometimes things happen), you've also got the security of two years of 24-hour Roadside Assistance. ** That'll cover towing to your nearest VW dealer, jump-starting or even refueling your gas tank. To make things go smoother, you'll be eligible for reduced interest rates on your purchase. So now even your money feels all warm and fuzzy inside. To meet WorldAuto standards, we set the bar a little higher. Every certified pre-owned Volkswagen is subject to a 112-point inspection.†† And no, one of those steps isn’t just kicking the tires. 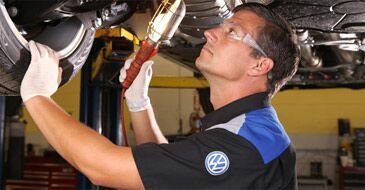 A certified Volkswagen technician goes through each car with a fine-tooth comb. And if they find anything wrong, they’ll repair or replace it. You’ll also receive a CARFAX® Vehicle History Report,™ so you’ll know your car’s history inside and out. We’ll even throw in three months of complimentary SiriusXM satellite service.‡ In short, your Volkswagen dealer will do everything they can to get you that new car smell, without that new car price. Alright, you’ve found the Volkswagen you’ve always wanted. Now it’s your chance to really make it your own with genuine Volkswagen accessories. Unlike other aftermarket parts, these are made specifically for your ride, so they’ll always be the perfect fit. Whether you want to add a rear spoiler to your Passat. Special 18" spoked alloy wheels to your Beetle. Or roof racks to your Golf. Because you’re not just buying a Volkswagen, you’re owning it. Even Your coverage has coverage. Just when you thought the warranty on Certified Pre-Owned vehicles couldn’t get any better, it does. Depending on the age and mileage of your vehicle, you can expand the coverage for up to 100,000 miles. Seriously, that’s like going around the world four times, with a side trip to Peru. Volkswagen Credit has five different plans to choose from that should fit your needs or budget. You may even be able to roll the cost of it into your financing. So you can protect your investment today, tomorrow, and waaaaay into the future. Go to your Volkswagen dealer. It’s where WorldAuto makes itself at home. Find the car you love. With a great selection of Volkswagen vehicles, the odds are in your favor. Kick the tires, check the CARFAX.® Every car gets a 112-point inspection†† and CARFAX® Vehicle History Report. One last thing: take the long way home. 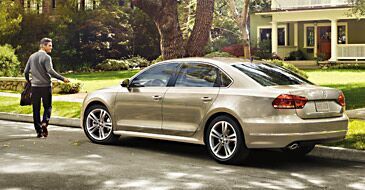 ©2012 Volkswagen of America, Inc. Printed in the U.S.A. Volkswagen of America, Inc., believes the specifications in this brochure to be correct at the time of printing. *Whichever comes first. Deductible may apply. See dealer for details. **Roadside Assistance provided by third-party provider. †Reduced rates for qualified buyers through Volkswagen Credit. See dealer for details. ††See dealer for details. ‡Three months of Sirius XM Satellite Radio for Sirius-equipped vehicles only. Limited warranty provided by a third party. See dealer for details. ©2012 Sirius XM Radio Inc. Sirius, XM and all related marks and logos are trademarks of Sirius XM Radio Inc. All rights reserved.